Welcome to BKL Technologies, manufacturer of the largest selection of airgun and rimfire scope mounts in the U.S. Our competition-grade scope mounting system includes scope mounts, scope rings, dovetail to weaver adaptors, and scope risers that utilize a quick-installing and self-aligning clamping system that fits both 11mm and 3/8" dovetails. BKL mounts are compatible with popular rimfire manufacturers such as Anschutz, CZ, Feinwerkbau, Marlin, Remington, Savage, Suhl and air rifle manufacturers such as Air Arms, AirForce, Beeman, Benjamin, BSA, Crosman, Daystate, Diana, Gamo and Webley. Try BKL, and discover why many shooters use no other mount. Strong One-Piece Clamping Base allows easy mounting of 1-inch and 30mm rifle or pistol scopes. 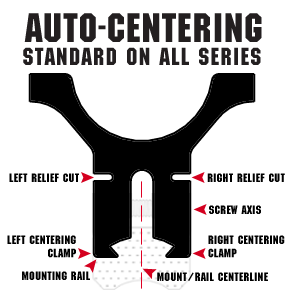 Patented Auto-Centering technology solves the problems created by varying mounting rail widths. Clamping Legs move equally as the clamping screws are tightened keeping the scope centered on the rail. Oversize mounting rails? No problem. 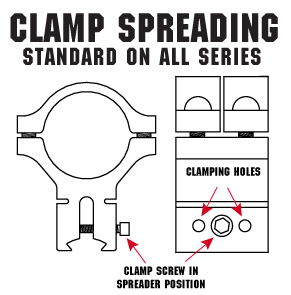 Clamping screws can be switched to BKL's unique Spreader Holes to evenly push the clamping legs apart allowing the mount base to slide onto the dovetail. Airgunners and Rimfire shooters also benefit from the proliferation of Picatinny rail-mounted optics and accessories with our Weaver/Picatinny to Dovetail Adaptor Mounts. BKL mounts are manufactured from aircraft-grade aluminum alloy on state of the art machinery in Texas.